Shirlene defended her Provincial title and brought home the gold! At provincials, Janet broke the provincial and national records in bench press with a 43 kg lift! 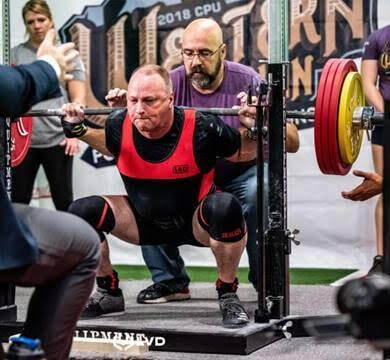 Mark had a 190 kg (415 lb) squat, a 125 kg (275 lb) bench, and a 225.5 kg (490 lb) deadlift! Blaine also came home with the gold, and broke the provincial bench press record not once, but twice, with a lift of 305 lbs! Janet's lifts were: 65 kg squat, 42.5 kg bench, and a 87.5 kg deadlift. These broke the previous records, which were also set by Janet! She ended up bringing home the gold! Blaine ended up bringing home the silver, and had some personal best lifts! Our very own Mat Palmer won the provincial title!